So, I have started breeding Lionhead rabbits and one of the most important things to me is making sure my babies turn out to be friendly and tame. This so far has been turning out fantastic. I handled the babies each day from the day they are born. I have spoken to people who have bought bunnies from me and they talk about what sweet bunnies they are. I have been able to meet back up with a couple of the bunnies, and see for myself how they are very sweet. They go limp in your arms and feel totally safe crawling all over you. I was afraid since their mom was very skittish that it may try to pass down to the babies, but they have all turned out fantastic. Sometimes, some babies seem to take longer than others to get settled in to being picked up and touched. I currently have two female kits that are about six weeks and are still a bit skittish. But I have had kits that seemed like this before, and turned out to be super sweet. The babies are raised in my room so that they are almost constantly around me, which makes it much easier to get them to be tame. 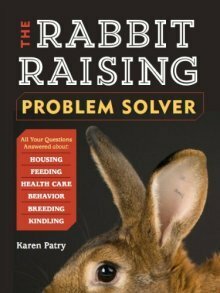 My question is, what are all the things I can do to really help all the bunnies be as tame as possible? I know a good bit of this rests on the owner's hands once they buy the little guy, they can't just ignore him and expect him to feel totally comfortable in his arms if they haven't touched him in months! I know to be careful with how much I handle the babies around the first ten days, but after that, is there a certain limit to how much handling I can do? Is there anything to avoid doing or make sure to do to create super lovable, friendly bunnies? 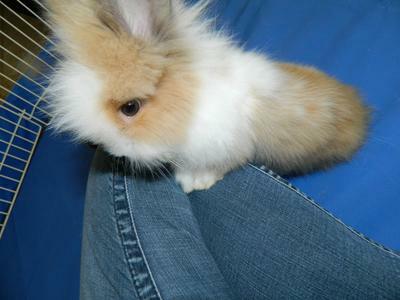 That's one stinkin' cute rabbit! You're doing a great job! If nothing's broke, there's nothing to fix, eh? I think my only thought is that since bunnies sleep during the day, that they get the opportunity to sleep for long stretches during the day. But, that's not hard to accommodate - kids go off to school until the afternoon, and adults work for 8 hours. The kits spend that entire time asleep. You're getting great results with the amount of handling you're giving your bunnies, so it is hard to find anything else to worry about.